Let’s agree to the most basic fact that, till you get your hairstyle right, your styling is not on point. Hairstyle is so crucial for the overall look with any ensemble. With sarees, it is even more important. This most gorgeous Indian ethnic attire can be totally made to look mind-blowing by finishing it off with an apt hairstyle. Just like how hairstyle is important, it is equally important to choose the one that suits your face shape. Our today article is to help all Indian girls who are blessed with a perfect round face! So, all you dear round shape women, we get your point that you have decided to wear your favorite saree for the next important moment in your life, but in dilemma as to what to do with your hair. If you are made to believe that braided hair or free hair, are the only way to match up with your sarees, then we have surprise waiting for you! 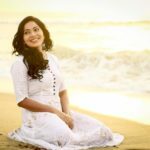 Though braids and free hair still tops among many who flaunt sarees, we have whole lot of innovative (yet easy) hairstyles that can give you a refreshing look with your sarees. From buns to curls, there are so many variations you can try and experiment. All you need is proper inspirations to get you started. That’s why we are here to help. Now, without waiting scroll down and see the numerous Indian hairstyles that you round face girls can style with sarees! If you have got your hair straightened recently, and if the saree you plan to wear is simple and plain, then don’t go overboard with your hairstyle. Our suggestion is to just blow dry your hair, apply a shining serum and keep it free with a simple middle parting. This hair style suits a lot for young girls. Also, it goes well when you plan saree for formal occasions where you don’t want to attract many eyeballs, yet you want to look stylish. So, next time, when you have your friend’s wedding or office outing, you now know which hairstyle to pick! This is actually a slight variation of the above hairstyle. This suits for those who are not into hair straightening, but are naturally blessed with straight hair with little volume. Girls, we know your hair is something that is already enviable. But to give a punchy look with sarees, all you need to do is use some voluminous shampoo, get a neat blow dry and curl the ends of your hair. You are all set. 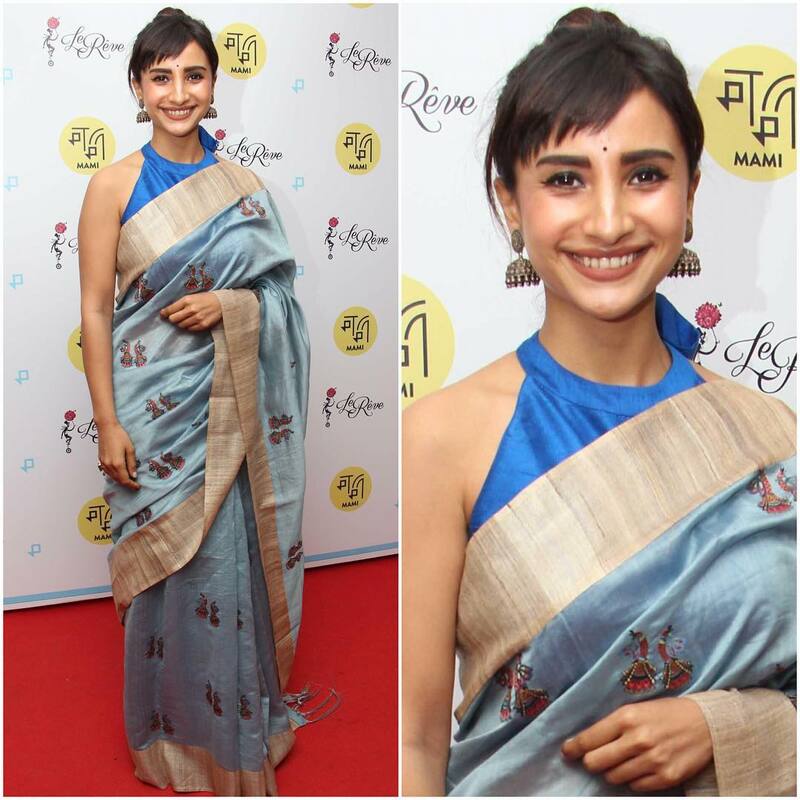 Again, this hairstyle suits so much for simple sarees where you don’t want to overload your look. This can be even worn to office or other formal events. Finally, try this hairstyle with high neck blouses and it will look even more stylish. Check out this tutorial for getting envious curls. Still braids have not lost its charm. Period. Braids suits so much for traditional events/functions. And it looks better on girls/women who have lovely thick hair to flaunt. Girls, who have thin hair, please do stay away from braids as it might not be flattering. Braided hair also looks good on silk and other conventional weaves. 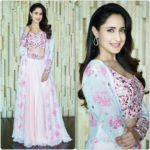 So, if you are planning for weddings, receptions with your expensive silk/Banaras sarees, and if you are blessed with a thick long hair, then without a doubt, you can go for the classic braided hair. We know some of you girls want to be utterly stylish even if you drape your mommy or grandma sarees. Good news is, even the oldest sarees can be made to look so contemporary and chic with the right hairstyle. That being said, what you need to do to get this look, is to opt for some sleek hairdo, preferably dramatic buns and finish them off with a catchy flower. Big red rose and any other equally attractive options will make this hairstyle so stylish and unique. 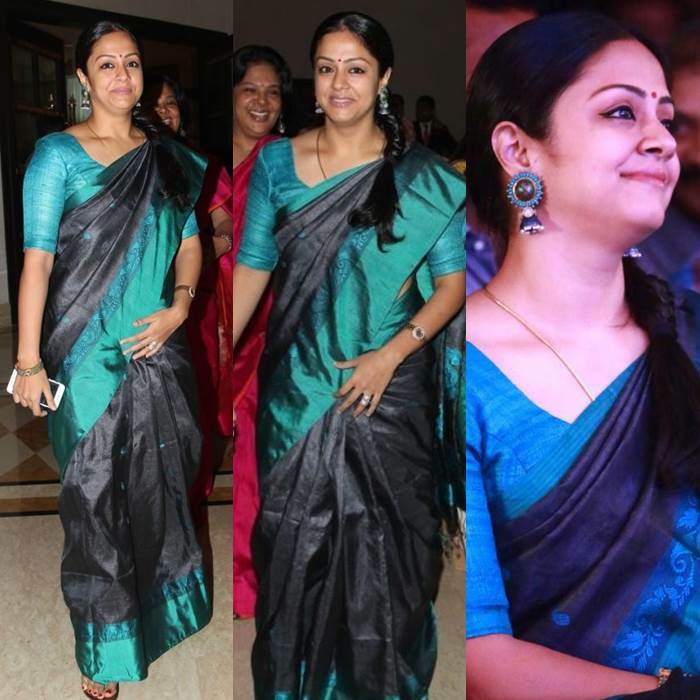 Thus, if you want to keep a stylish appeal to an otherwise simple old saree, you can blindly go for this hairstyle. Check out this tutorial for perfecting this hairstyle. Front puffs are not just for oval shaped face, round face girls can also try. These are right now very hot on the trend. The versatility of this hairstyle and chicness it brings to an overall look is so dramatic and elegant. That’s why many girls are crazy over this hairstyle. You can try them with sarees too. 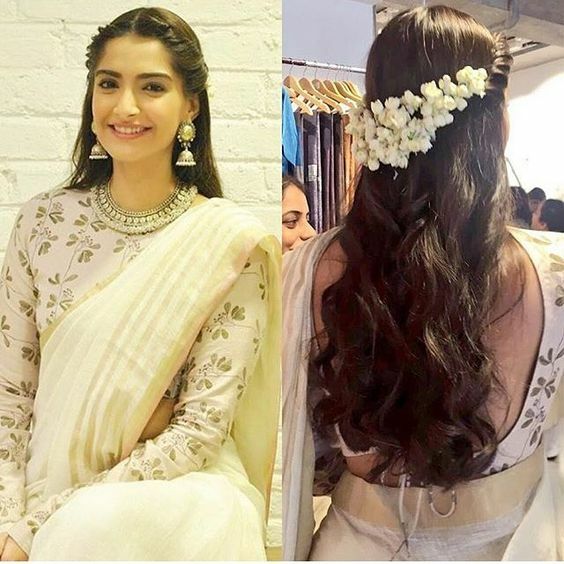 This hairstyle goes well if you are naturally blessed with straight hair, or if you could temporarily straighten your hair before the occasion where you want to wear your saree. In any case, if you have a glossy straight hair, this hairstyle will look unbeatable with any saree. Try this tutorial if you attempt to do this hairstyle by yourself. If you are a lover of braids, but want a cooler look instead of looking all traditional and decked up, then you have an option here. Messy side braids will meet your stylish demands. Also, this hairstyle can give you a younger look. You can wear this with any designer sarees and expensive picks. When you do this hairstyle, try wearing statement earrings, so you can keep the attraction around your hairstyle and the earrings. Here below is an easy tutorial for you to follow and flaunt this beautiful hairstyle. If you want to let your hair free but also want to look more traditional, then you can try this hairstyle. It is very simple one, and goes beautiful with any kind of sarees. If you want to highlight this hairstyle a bit more, then go for attractive hair clips to garner more attention. You can do this even on 1 minute. Follow this tutorial to get an idea about this hairstyle. Of course, free hair is the most popular way to style your hair these days, But believe it or not, it has millions of options by the way your curl your hair, you take the partition..etc. 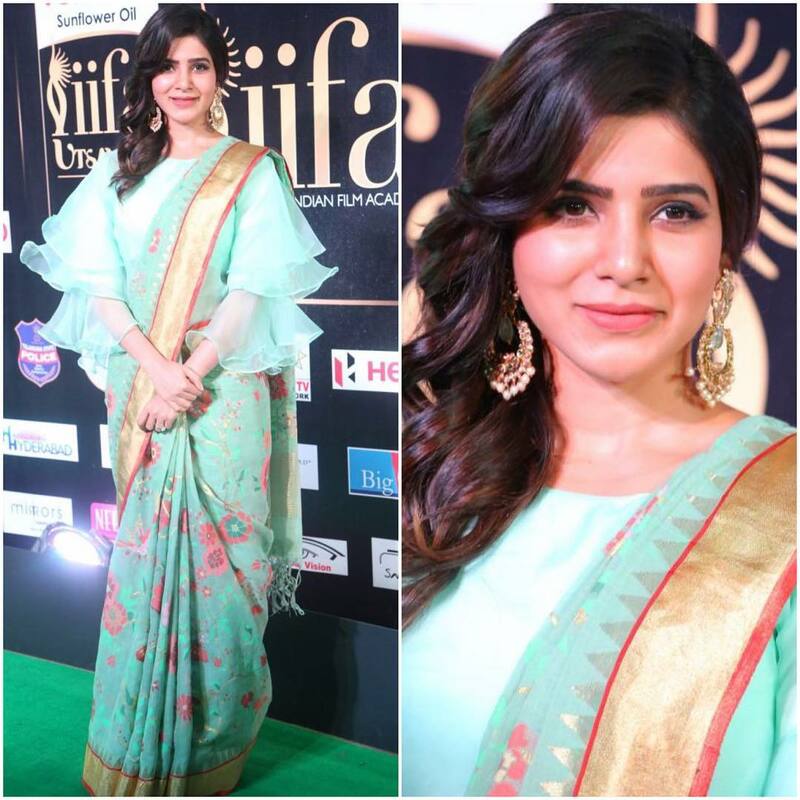 Stylish side swept with a slight front puff and a ruffled bottom is a wonderful choice for round face girls who want to look drop dead gorgeous on any fancy sarees. Try this hairstyle if you want to keep things subtle and just highlight your saree alone. That’s why this is more suitable to wear to expensive designer sarees. If you want to get this right, check out this video tutorial. For some reason, you want to go a bit dramatic on the makeup and hairstyle, and be simple with sarees, hair buns are great options to try. 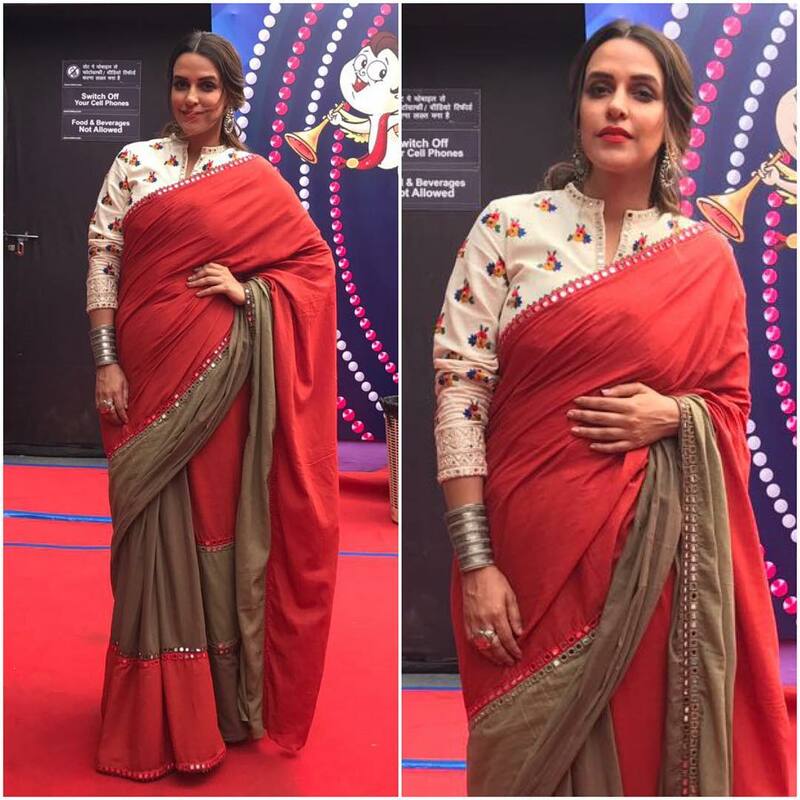 There are numerous hair bun options available, but for an enticing look, you can try a side parted bun with a highlighting jhumka to add an angle to this overall saree style. For a simple bun hairstyle, check out this video. This is one of the easiest hairstyle options, yet that make you look so dressed up in person. This hairstyle looks so good, when you have mild color sarees to wear for an event/party. Baby pink, sea blue, mild beige are some hues that need a dramatic hairstyle like this to boost your look. If you opt this hairstyle with heavy work saree, it might look a bit much. So, go for this with light sarees. To compliment this hairstyle, add an attractive earrings and statement neck piece. To learn this super cool hairstyle, get the inspiration from this video. We already saw front puffs are equally flattering on round face girls. This hairstyle is similar to the one which we already saw. Only difference being, the volume of puff and the sleek finish in the ponytail. It gives a very young and stylish appeal. Even with the less hair density, you can try this! To try full puff ponytail, check out this video tutorial. There are many variations of pony tail you can try with sarees. This one tops the list as it suits women of all age and hair type. Girls even with thin hair can try this. This will make your hair look voluminous. Simple plain sarees, georgette, chiffon sarees that looks sleek when you wear needs a boosted hairstyle like this to compensate. Here is the video that teaches how to get voluminous front puff with curls in a matter of minutes. 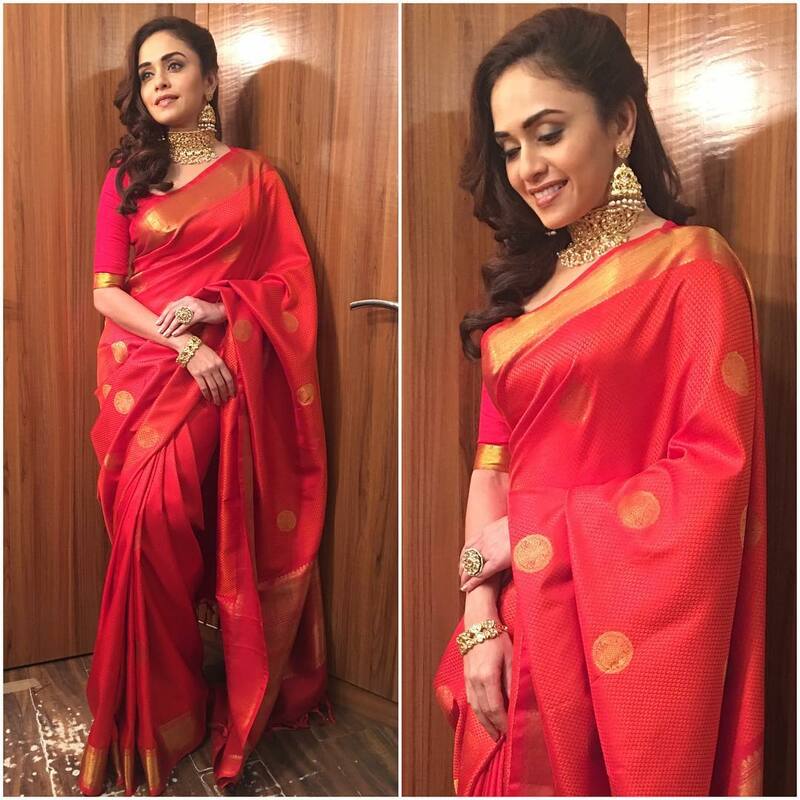 Sometimes your saree, or the event you want to wear them, demands a rich dressed up look. If that’s the case, go for any hair buns and highlight them with attractive hair accessories. These types of hairstyles are generally suitable for bridal ceremonies, festive events, family functions..etc. There are tons of fancy hair ornaments available online and you can simple buy them based on your taste. If you want to give a vintage appeal to your saree style, then nothing can beat this dramatic hairstyle. Sleek front parted hair with a puffed-up bun at the back is something you need to try if you want to look absolutely classy in your saree. While wearing this hairstyle, try a board neck blouse to elevate the look further. Here is a tutorial to try similar hairstyle by yourself. Flowers are the best thing you can add to your hairstyle to give a traditional look. Be it any hairstyle, flowers do convert you to a homely looking person. So, if you want to give this kind of feel with your sarees, then simply tie your hair for a bun and adorn them with a row of jasmine. Ok. We understand, you curly hair round face girls! Most of the hairstyles explained so far belong to the beauties who have fine straight hair. That doesn’t mean you have less option to try. Just like a fine hair diva, your hair is equally alluring. All you need is to pick the options that suit your already beautiful hair. For a basic saree look, you can go for a messy side loose braid. You really don’t need much volume or hair length to make this work for you. If you have medium length hair, then you can just try this next time to get all the appreciation you deserve. Here is the tutorial for you to try and look fabulous on this. Of all the hairstyles that we have seen so far, this probably is the easiest and simple hairstyle. It is incredibly easy and so Indian in the finish. It can be opted by anyone and look beautiful. A simple pony tail with a deck of jasmine around it is going to make you look so chic and cute. I guess, by seeing the picture below, you will agree with us. This is another braided hairstyle option that you can try with sarees. If you have enough volume and length to go for braids, then opt for fish tail braids instead of default ones. 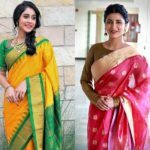 While simple braids are highly meant for traditional sarees, fish tail can be comfortably worn with any designer sarees as it gives a stylish look. Here is an incredible video to explain how this can be done. Messy buns always attract divas from all corners of the world. 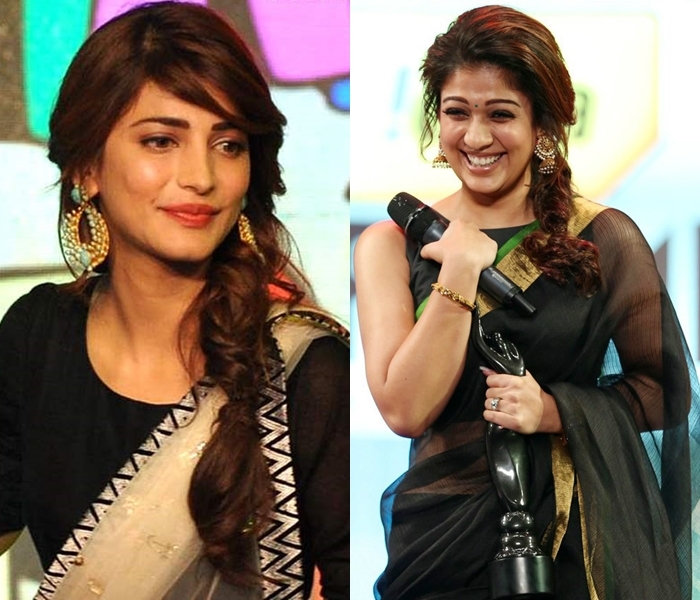 They look unbelievably beautiful with sarees too. Can you believe that this messy style can be drop dead gorgeous with your silk sarees too ? If you are in dilemma you need to take a look below for how some women make it work for variety of sarees! While wearing this hairstyle, make sure your blouse back is attractive to catch everyone’s attention. Messy high bun with a mind-blowing blouse back is a totally winning combination. Check out this tutorial to experiment this hairstyle. This is similar to above, except the bun is placed on sides for a new look. This kind of side buns, as we already saw, needs catchy earrings to round off the look. So if you opt for this style, don’t forget to wear statement earrings or ear cuffs of your choice to make it stand out! Here is a super chic side bun for you to attempt! And all you round face beauties, who have front haircut and flattering bangs, fret not, we have something for you too! Tie the hair for a chic knot and opt for a high neck blouse. If you can be bit fashionable, try this hairstyle with halter neck blouses. And here is the video tutorial for your inspiration. We have seen many versions of ponytail to flaunt with sarees, and this one is for those who love relaxed look with sarees. This goes well for the occasions where you can be a little causal. Here is a tutorial for you to follow and perfect his flattering hairstyle. We already saw side swept hairstyle with a little puff in the front suits sarees that needs more attention than the hairstyle. This also belongs to the same genre. Only difference, being the voluminous curls, at the bottom. 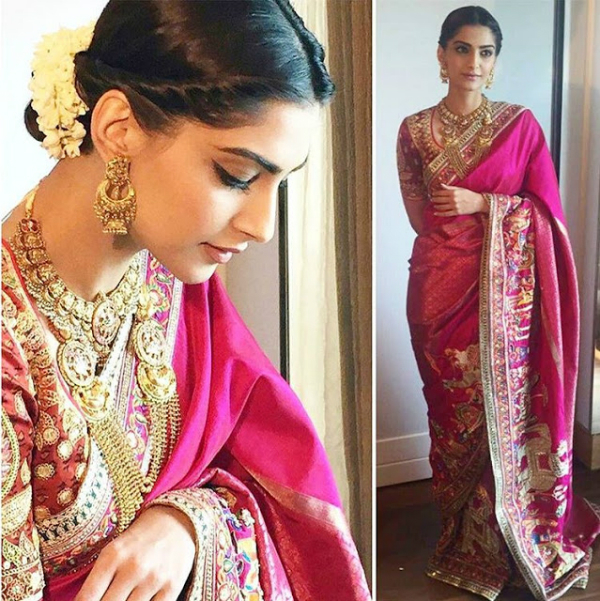 Again, this style goes well when you want to keep the attention on sarees rather than the hairstyle itself. Here below is the video to try this hairstyle. This is another ponytail version that can work well with sarees. While the earlier versions are high ponytails, this one is low where the hair is tied exactly at the back of neck. This is for those, who don’t want to do much of experimentation but rather stick to some basic versions. This hairstyle goes with sarees which looks sleek when you wear. We have seen many side swept hairstyles, and on the list, please add this one too. Because, it can be so gorgeous when you finish your look with a fancy choker and earrings. If you like to flaunt your jewellery with sarees and want all the attraction on your accessories around the face, then you can highlight them by trying this simple hairstyle. To know how to style hair this way, try the below tutorial. Another simple and casual hairstyle to try with sarees is a top knot. This hairstyle is so popular among all fashionistas and it is being tried out with all western ensembles. But good news is, you can be delightfully stylish in your sarees too with this one! Here is a super easy top knot tutorial to try in matter of minutes. This hairstyle flares well if you want to keep others attention on your face and eyes. With dark and flattering makeup, you can keep the people glued to you by opting for hairstyle that has side curls. Buns with braids/curls on sides can look too good with sarees. For a video tutorial, check this out. With many women opting for hair straightening, this could come as a relief for those who want variations in the free hairstyle. 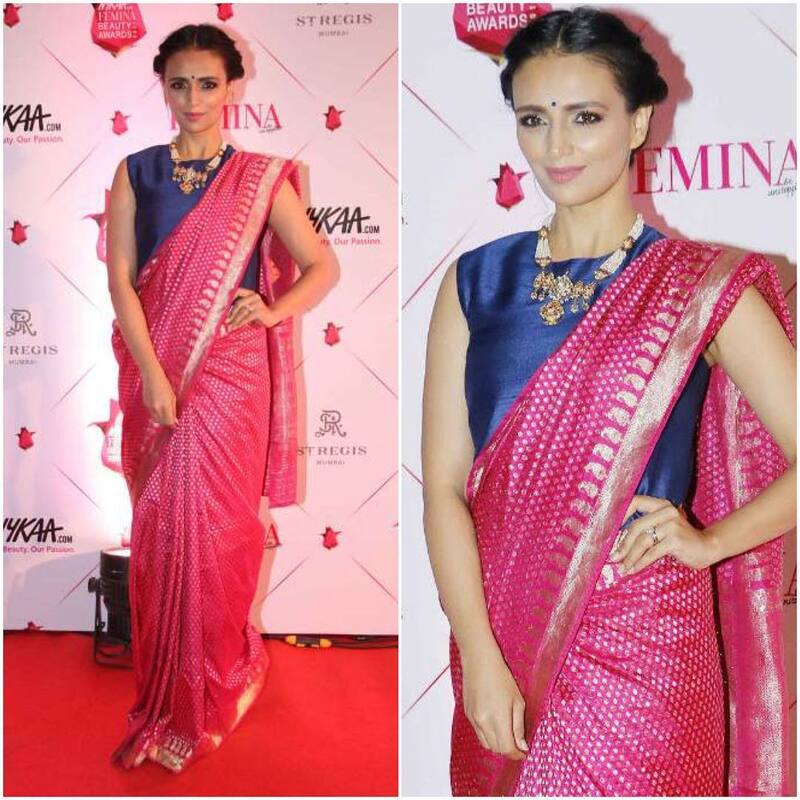 With a simple side parted sleek hairdo, you can pretty much pull off any saree with a dashing look. This is the third hairstyle we see with the winning combination of flowers. Like ponytails and buns, flowers can be worn with simple side curls. While most of the earlier versions of front puff are with an elegant buns and ponytails, this is a much simple one to try, as in this case you are just going to leave rest of your hair down. If you get your front puff right, then this one could simply be majestic. This is another bun version that goes well with sarees. In this style, you will have mini braids in the front, all of which are tied in the back to an elegant bun. If you wear heavy drapes that needs bold hairstyle, then this could be it. Here is the video tutorial to try this. 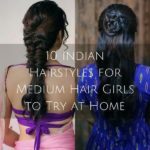 That’s the extensive list of Indian hairstyles that will suit round face girls when they drape sarees. Don’t be conservative and stick to the default styles, be creative and try new ones on each occasion. Always chose the hairstyle that compliments your hair texture and density. Use right hair accessories for a more polished finish. When you select hairstyles for important occasions, be sure to try them in advance along with your entire ensemble. This will reduce your makeup stress. When you opt for dramatic hairstyles, keep your outfit subtle. And when you go for heavy work sarees, keep your hairstyle minimal so they both can balance the overall look. Another important thing you need to focus along with hairstyle is the right neck piece and earrings that you plan to wear. They both stick so close to hair, so the choice you make should complement the hairstyle you opt. Stay stylish! Let us know which is your favorite pick among the above hairstyles? Previous articleFollow This Instagram Account For Wearable Fashion Inspiration!